BackWPup is shipped with support for bzip2 (bz2), a common algorithm used to compress files and directories. In this documentation we want to explain why you need to convert bzip2 file to zip file to make a restore with BackWPup, our WordPress backup plugin. Even if php supports this algorithm his implementation doesn’t give the possibility to decompress large backup archives in a manner that allows us to extract the archive by chunk. It is not possible to open the archive, extract the files and then open again the archive and extract other files. Everytime we open the archive we must read it from beginning. For this and other reasons we discourage you to use bz2 compression. If you have created a backup using bz2 you must convert it to .zip or .tar.gz or .gz before you start to restore it. We suggest you to convert to .zip that is the most supported algorithm unless you don’t have ZipArchive in your server. In that case a .tar.gz could be the best solution. To convert the bz2 file into a zip one you can use an application such as 7zip for windows or a service like cloudconvert. If you are running macOs or a linux distribution you can take advantages of the built in support of these operating systems. 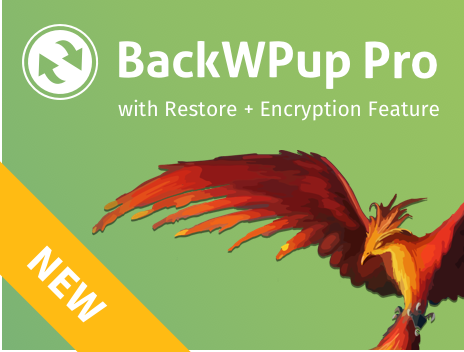 After you have converted the backup go to BackWPup → Restore page within the WordPress backend and upload the file. The restore will take care of the rest. If you need more help on this topic, don’t hesitate to contact us on wordpress.org for free support or on backwpup.com/support if you bought the Pro version.